North Shore Town Square. Castles in the Clouds presents the second Sunday Funday for Daniel. 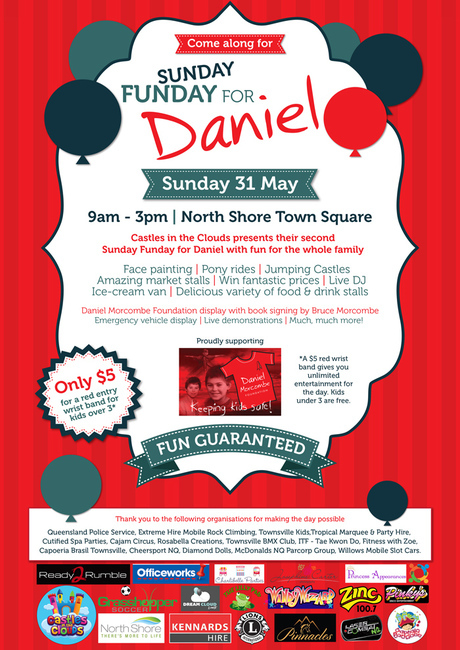 Daniel Morcombe Foundation display with book signing by Bruce Morcombe. Community Stalls/Information Stalls/Rides for Kids/Entertainment/Live Demonstrations/Face Painting. Only $5 to receive a re wristband for children over 3years to enjoy unlimited entertainment for the day!